The Trigonometric Function block performs common trigonometric functions and outputs the result in rad. You can select one of these functions from the Function parameter list. If you use the CORDIC approximation method (see Definitions), the block input has some further requirements. When you use signed fixed-point types, the input angle must fall within the range [–2π, 2π) rad. When you use unsigned fixed-point types, the input angle must fall within the range [0, 2π) rad. Inputs must be the same size, or at least one value must be a scalar value. Both inputs must have the same data type. When you use signed fixed-point types, the word length must be 126 or less. When you use unsigned fixed-point types, the word length must be 125 or less. This table summarizes what happens for an invalid input. Generated code Undefined behavior occurs. 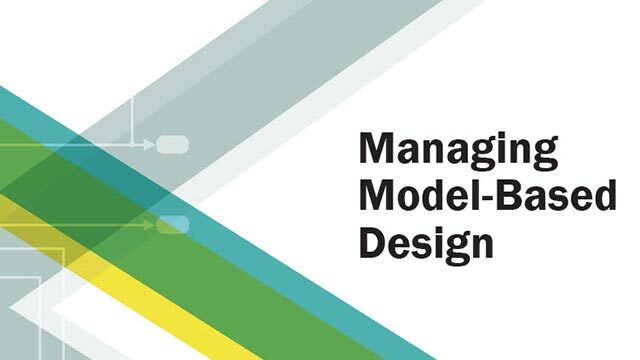 Avoid relying on undefined behavior for generated code or accelerator modes. When you set Function to atan2, the block shows two input ports. The first input (Port_1) is the y-axis or imaginary part of the function argument. The second input (Port_2) is the x-axis or real part of the function argument. You can use floating-point input signals when you set Approximation method to None or CORDIC. However, the block output data type depends on which of these approximation method options you choose. Depends on your selection for Output signal type. Options are auto (same data type as input), real, or complex. Same as input. Output signal type is not available when you use the CORDIC approximation method to compute the block output. Input must be real for the sin, cos, sincos, cos + jsin, and atan2 functions. Output is real for the sin, cos, sincos, and atan2 functions. Output is complex for the cos + jsin function. Complex input signals are supported for all functions in this block, except atan2. You can use fixed-point input signals only when Approximation method is set to CORDIC. The CORDIC approximation is available for the sin, cos, sincos, cos + jsin, and atan2 functions. For the atan2 function, the relationship between input and output data types depends also on whether the fixed-point input is signed or unsigned. This fixed-point type provides the best precision for the CORDIC algorithm. To enable this port, set Function to atan2. Fixed-point input signals are supported only when you set Approximation method to CORDIC. Sine of the input signal, in rad. To enable this port, set Function to sincos. Cosine of the input signal, in rad. Specify the trigonometric function. The name of the function on the block icon changes to match your selection. Specify the type of approximation for computing output. You want to use the default Taylor series algorithm. To enable this parameter, set Function to sin, cos, sincos, cos + jsin, or atan2. To use fixed-point input signals, you must set Approximation method to CORDIC. Specify the number of iterations to perform the CORDIC algorithm. The default value is 11. When the block input uses a floating-point data type, the number of iterations can be a positive integer. When the block input is a fixed-point data type, the number of iterations cannot exceed the word length. For example, if the block input is fixdt(1,16,15), the word length is 16. In this case, the number of iterations cannot exceed 16. Set Function to sin, cos, sincos, cos + jsin, or atan2. Set Approximation method to CORDIC. Specify the output signal type of the Trigonometric Function block as auto, real, or complex. Setting Approximation method to CORDIC disables this parameter. When Function is atan2, complex input signals are not supported for simulation or code generation. Use the Trigonometric Function block to compute the sine of a floating-point input. Use the Trigonometric Function block to compute the CORDIC approximation of sincos for a fixed-point input signal. Compares the complex exponential output for two different configurations of the Trigonometric Function block. CORDIC is an acronym for COordinate Rotation DIgital Computer. The Givens rotation-based CORDIC algorithm is one of the most hardware-efficient algorithms available because it requires only iterative shift-add operations (see References). The CORDIC algorithm eliminates the need for explicit multipliers. Using CORDIC, you can calculate various functions, such as sine, cosine, arc sine, arc cosine, arc tangent, and vector magnitude. You can also use this algorithm for divide, square root, hyperbolic, and logarithmic functions. Increasing the number of CORDIC iterations can produce more accurate results, but doing so also increases the expense of the computation and adds latency. Volder, JE. “The CORDIC Trigonometric Computing Technique.” IRE Transactions on Electronic Computers EC-8 (1959); 330–334. Andraka, R. “A survey of CORDIC algorithm for FPGA based computers.” Proceedings of the 1998 ACM/SIGDA sixth international symposium on Field programmable gate arrays. Feb. 22–24 (1998): 191–200. Schelin, Charles W. “Calculator Function Approximation.” The American Mathematical Monthly 90, no. 5 (1983): 317–325. Not all compilers support the asinh, acosh, and atanh functions. If you use a compiler that does not support those functions, a warning appears and the generated code fails to link. For more information about HDL code generation, see Trigonometric Function. 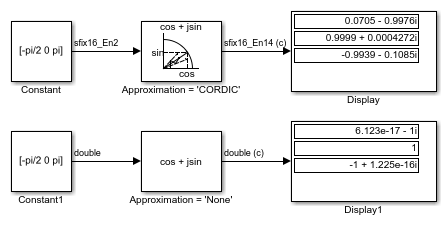 This block supports fixed-point and base integer data types when you set the Function to sin, cos, sincos, cos + jsin, or atan2, and set the Approximation method to CORDIC.